An Admissions Representative will interact with potential students and provide them information about the application and admission process. 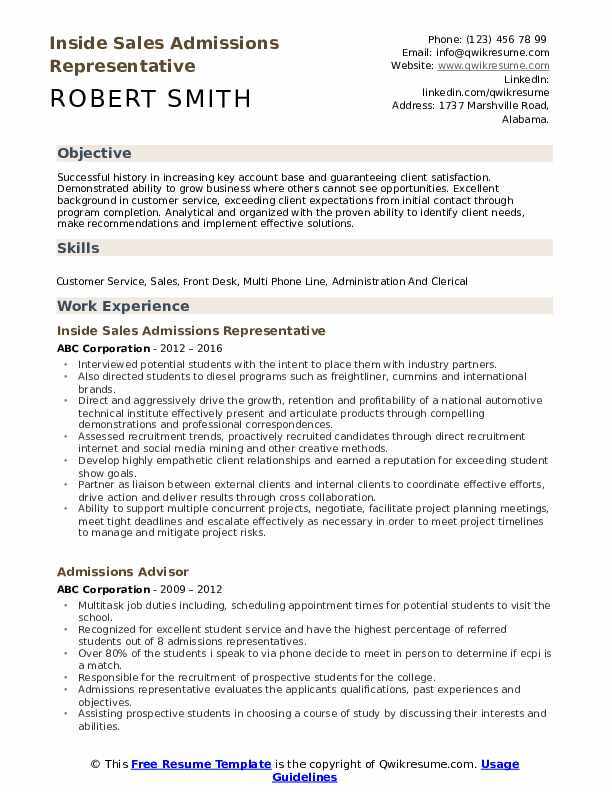 A well-drafted Admissions Representative Resume highlights the list of the following duties and tasks – helping students seeking admission with enrolment process, selecting the right student by conducting recruitment process, helping students in filling forms, contacting prospective students and interviewing them, arranging campus interviews and acting as a liaison between the institute and the students. 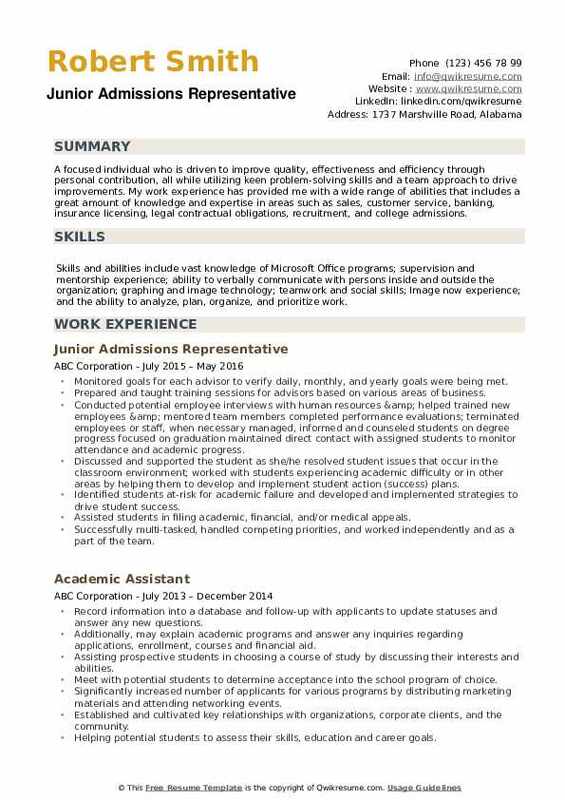 To get into this role of helping students, the job applicants must depict these skills on their resumes – knowledgeable about school and academic programs, ability to conduct and handle campus interviews and college fairs; proficiency in using the latest technology to track admission data, and proficiency in MS Office and software applications. Candidates are expected to have a bachelor’s degree and relevant work experience. 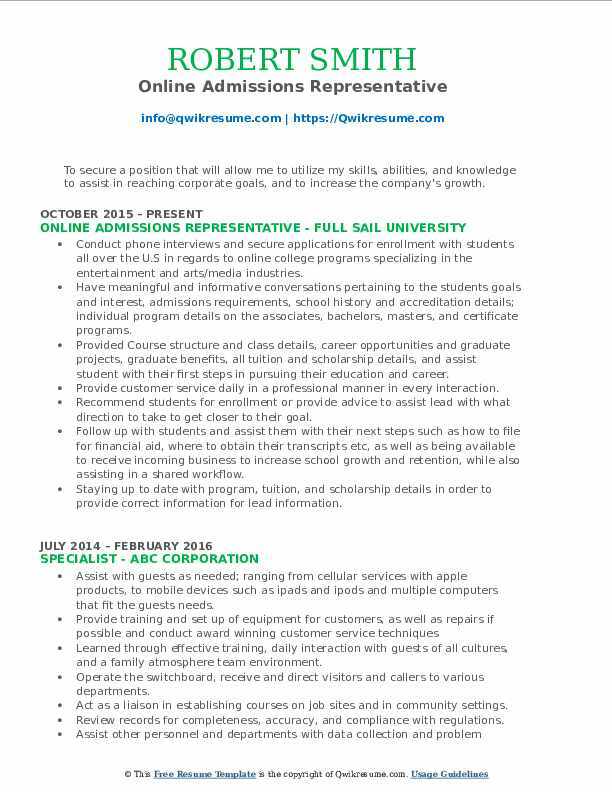 Summary : Objective To obtain the position of Enrollment Solutions Specialist in which my 8 years in educational sales, college education, and proven phone skill abilities will facilitate the achievement of company goals. Exceptional communication, interpersonal, and public speaking skills Possess leadership skills to unite and motivate others in working towards a common goal Skilled in areas of educational recruiting and sales. 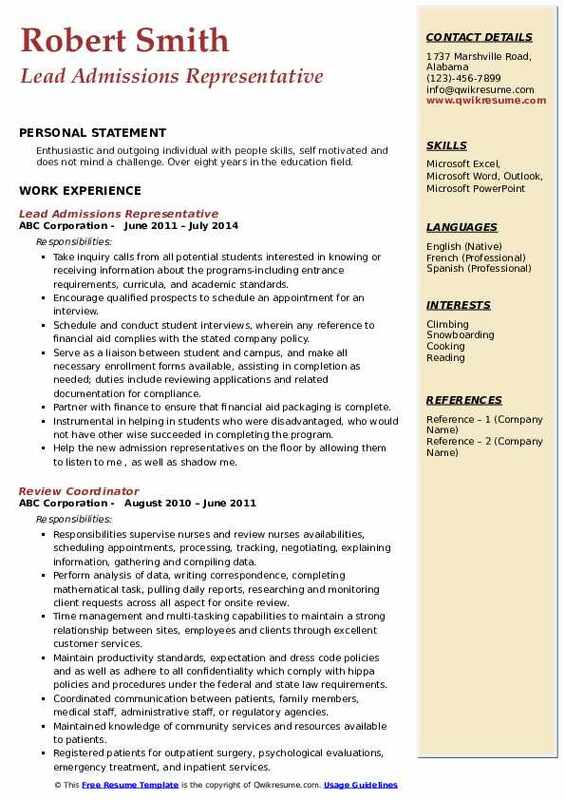 Skills : Proficient computer skills including Microsoft Word, Outlook, Excel, and PowerPoint Advanced Spanish Language Skills (Wide Knowledge) and English Proficiency. Follows up with students as they continue through the financial aid and enrollment process. Exceeds expected outbound calls to future prospects in order to facilitate the process at an estimated average of over 250 calls per week. Recruits prospective students and guides them through the process from exploration of the college to their first day in class. Collaborates with all departments, management, students, and community resources to solve problems and assist students while enriching and the student's experience and help improve life situations. Champion communicator for student prospects including phone work, person to person interfacing, e-mail, text, and social media communication. Collector of information for student prospects; communicating with instructors to maintain current course content. 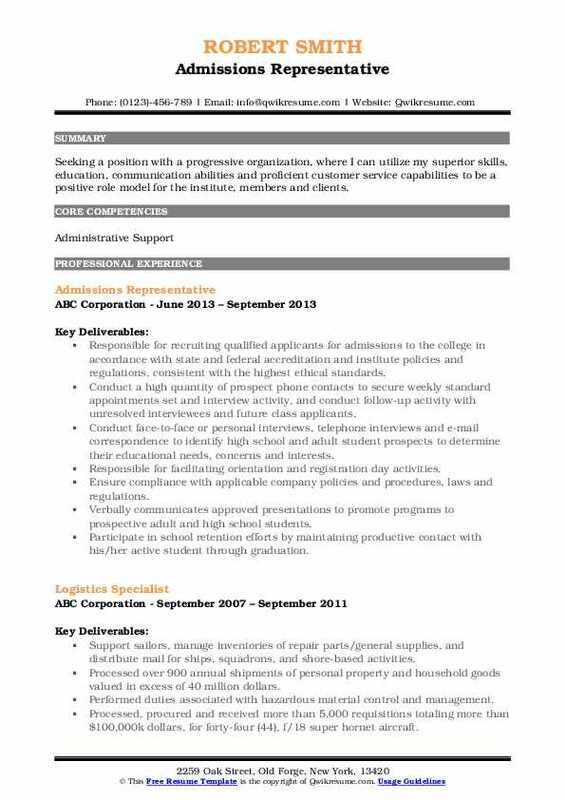 Attends college career fairs and job fairs in order to recruit prospective students and to collect referrals above and beyond college supplied leads. Public speaker to groups of various sizes providing insight to college exploration and the enrollment process. Designated champion of spanish-speaking interfacing at the college, assisting person to person as needed when spanish language barriers are encountered. Organizes student volunteers to serve as ambassadors to the college in the area of personal testimonials and mentors. 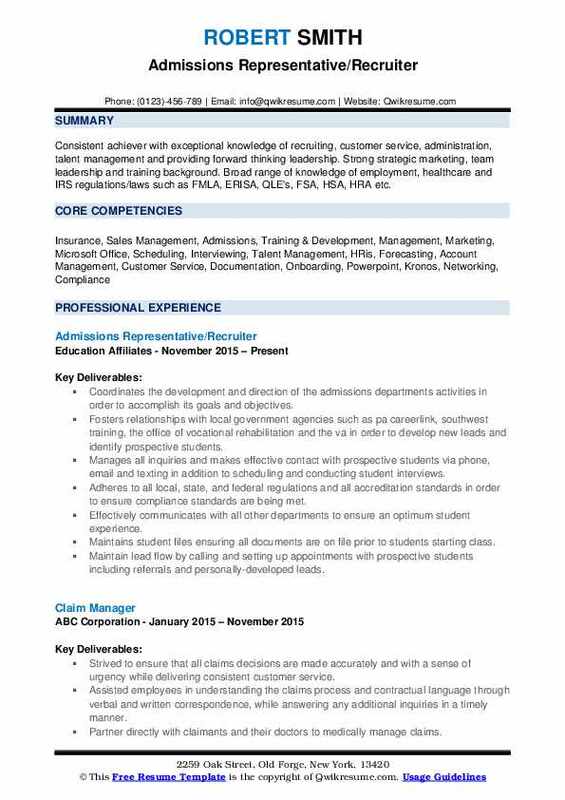 Summary : I am an experienced admissions representative with over 9 years of experience. I have strong communication skills. 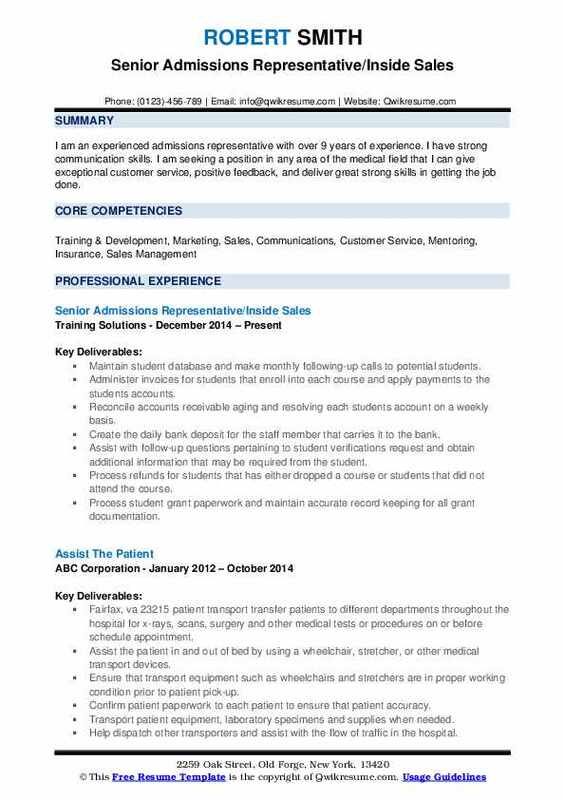 I am seeking a position in any area of the medical field that I can give exceptional customer service, positive feedback, and deliver great strong skills in getting the job done. Maintain student database and make monthly following-up calls to potential students. Administer invoices for students that enroll into each course and apply payments to the students' accounts. Reconcile accounts receivable aging and resolving each student's account on a weekly basis. Create the daily bank deposit for the staff member that carries it to the bank. Assist with follow-up questions pertaining to student verifications request and obtain additional information that may be required from the student. Process refunds for students that has either dropped a course or students that did not attend the course. Process student grant paperwork and maintain accurate record keeping for all grant documentation. Prepare new class packets and facilitate new class orientation each month. Maintain the each students chart and make sure that are not any missing documentation. Schedule appointments with students, managers, and directors for conflict resolution. Summary : 10 years of experience in Admissions and Training Performed multiple business development, recruiting and marketing tasks Proven ability to multitask, manage heavy workflow and problem solving. Trained, onboarded and developed new admissions advisors. Tracked goals and kept accurate enrollment and retention records ensuring that team members were meeting and exceeding admissions goals and requirements. Gave weekly presentations to local guidance counselors and school administrators to promote university initiatives. Responsible for student success from recruiting to enrollment and following up until graduation and through career services. Providing excellent advisor to student relationship through trust and rapport. Setting students up for success through scholarship applications, student financial aid, enrolling in the correct courses and following up with students and parents on satisfaction, successes and challenges. Making contact with prospective students and setting face to face appointments. Creating a fun and pleasant student environment and working with parents to help create a solid foundation network for our students. 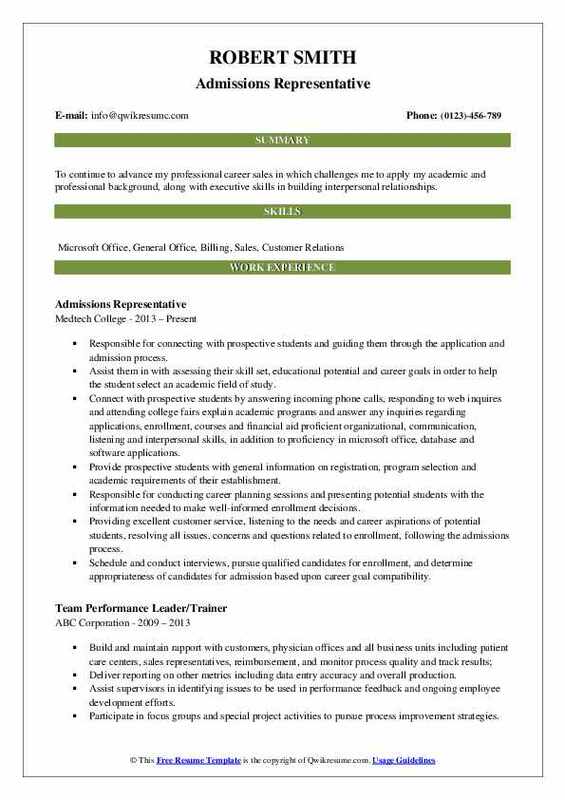 Objective : Seeking a position in admissions that will allow me to utilize admission and customer skills, more importantly help a college enhance more students' lives. Meet all enrolled students after their appointment with the financial aid office. Adhere to work schedules as designated by the director of local admissions. Professional representation of computer career center a division of vista college. Show enthusiasm and excitement in being a local admissions representative. Utilize accepted and ethical enrollment practices in relation to accreditation, federal and state rules maintain the performance standards and percentages. Receives all inquiry calls from potential students and promptly follow-up by setting appointments. Performs all other duties as assigned by the admission's director president. Maintains a lead management system that safeguards the value of the college's significant investments conducts effective phone presentations and interviews with each candidate. Objective : Ambitious worker with excellent researching, time management and problem solving skills. Quality-focused individual focused on driving sales and maximizing profits. 15+ years of experience in sales and customer service. Results-oriented excelling in identifying customer/patron needs and providing solutions. Responsibilities conducts face-to-face or personal interviews, telephone interviews and e-mail correspondence to identify high school and adult student prospects to determine their educational needs, concerns and interests. Responsible for facilitating orientation and registration day activities. Ensures compliance with applicable company policies and procedures, laws and regulations. Verbally communicates approved presentations to promote programs to prospective adult and high school students. Participates in school retention efforts by maintaining productive contact with his/her active students through graduation. Skills used possess strong interpersonal skills such as the ability to build cooperative relationships with a diverse customer base by being perceptive of others' reactions and understanding why they react as they do; the ability to ask questions to identify the motivations of others; generating new student prospect referrals from a diverse customer base; and the ability to make presentations and conduct interviews. 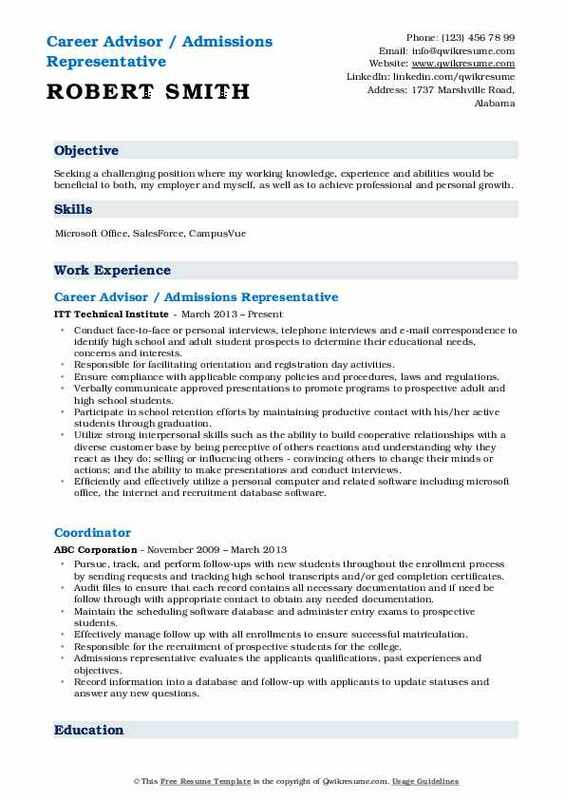 Efficiently and effectively utilize a personal computer and related software including microsoft office, the internet and recruitment database software. Handle multiple tasks and due date pressures utilizing strong planning, organization and time management skills while generating a high level of quality work product. Summary : Seeking a challenging position where my working knowledge, experience and abilities would be beneficial to both, my employer and myself, as well as to achieve professional and personal growth. Conduct face-to-face or personal interviews, telephone interviews and e-mail correspondence to identify high school and adult student prospects to determine their educational needs, concerns and interests. Ensure compliance with applicable company policies and procedures, laws and regulations. Verbally communicate approved presentations to promote programs to prospective adult and high school students. Participate in school retention efforts by maintaining productive contact with his/her active students through graduation. Utilize strong interpersonal skills such as the ability to build cooperative relationships with a diverse customer base by being perceptive of others' reactions and understanding why they react as they do; selling or influencing others - convincing others to change their minds or actions; and the ability to make presentations and conduct interviews. Ability to handle multiple tasks and due date pressures utilizing strong planning, organization and time management skills while generating a high level of quality work product. Headline : To secure a position that will allow me to utilize my skills, abilities, and knowledge to assist in reaching corporate goals, and to increase the company's growth. Conduct phone interviews and secure applications for enrollment with students all over the U.S in regards to online college programs specializing in the entertainment and arts/media industries. Have meaningful and informative conversations pertaining to the student's goals and interest, admissions requirements, school history and accreditation details; individual program details on the associates, bachelors, masters, and certificate programs. Provided Course structure and class details, career opportunities and graduate projects, graduate benefits, all tuition and scholarship details, and assist student with their first steps in pursuing their education and career. Provide customer service daily in a professional manner in every interaction. Recommend students for enrollment or provide advice to assist lead with what direction to take to get closer to their goal. Follow up with students and assist them with their next steps such as how to file for financial aid, where to obtain their transcripts etc, as well as being available to receive incoming business to increase school growth and retention, while also assisting in a shared workflow. Staying up to date with program, tuition, and scholarship details in order to provide correct information for lead information. Objective : Seeking a position with a progressive organization, where I can utilize my superior skills, education, communication abilities and proficient customer service capabilities to be a positive role model for the institute, members and clients. Responsible for recruiting qualified applicants for admissions to the college in accordance with state and federal accreditation and institute policies and regulations, consistent with the highest ethical standards. Conduct a high quantity of prospect phone contacts to secure weekly standard appointments set and interview activity, and conduct follow-up activity with unresolved interviewees and future class applicants. Participate in school retention efforts by maintaining productive contact with his/her active student through graduation. Maintain communication and establish working relationship with many students during and after provisional period. Generates 150+ outbound calls on a day-to-day basis to set appointments for potential admissions. Headline : Enthusiastic and outgoing individual with people skills, self motivated and does not mind a challenge. Over eight years in the education field. Take inquiry calls from all potential students interested in knowing or receiving information about the programs-including entrance requirements, curricula, and academic standards. Encourage qualified prospects to schedule an appointment for an interview. 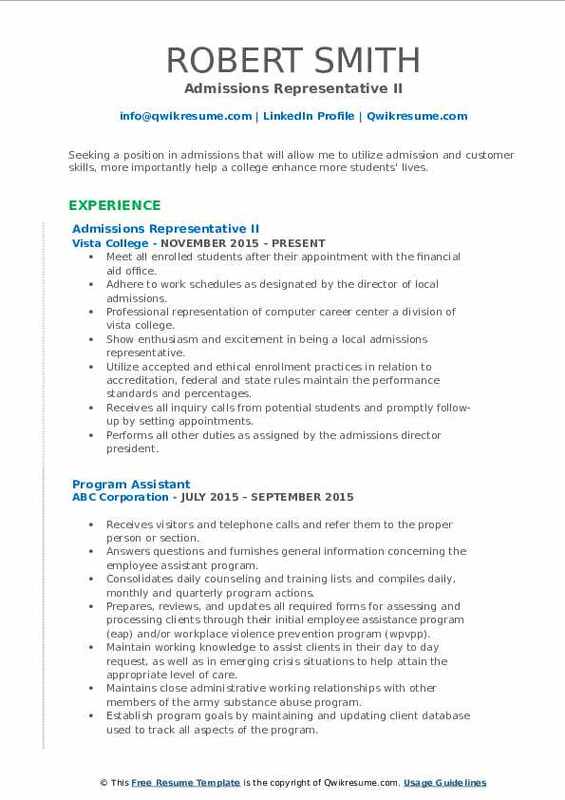 Schedule and conduct student interviews, wherein any reference to financial aid complies with the stated company policy. Serve as a liaison between student and campus, and make all necessary enrollment forms available, assisting in completion as needed; duties include reviewing applications and related documentation for compliance. Partner with finance to ensure that financial aid packaging is complete. Instrumental in helping in students who were disadvantaged, who would not have other wise succeeded in completing the program. Help the new admission representatives on the floor by allowing them to listen to me , as well as shadow me. Built strong relationships and presented course curriculum and programs to key decision makers, prospective students, and veterans. Connect with prospective students by answering incoming phone calls and making outbound calls to potential students. Objective : A focused individual who is driven to improve quality, effectiveness and efficiency through personal contribution, all while utilizing keen problem-solving skills and a team approach to drive improvements. My work experience has provided me with a wide range of abilities that includes a great amount of knowledge and expertise in areas such as sales, customer service, banking, insurance licensing, legal contractual obligations, recruitment, and college admissions. 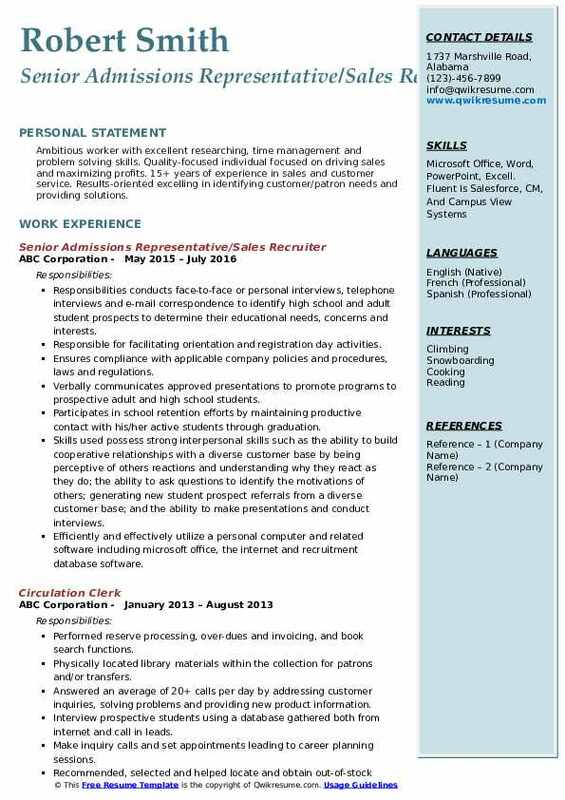 Skills : Skills and abilities include vast knowledge of Microsoft Office programs; supervision and mentorship experience; ability to verbally communicate with persons inside and outside the organization; graphing and image technology; teamwork and social skills; Image now experience; and the ability to analyze, plan, organize, and prioritize work. Monitored goals for each advisor to verify daily, monthly, and yearly goals were being met. Prepared and taught training sessions for advisors based on various areas of business. 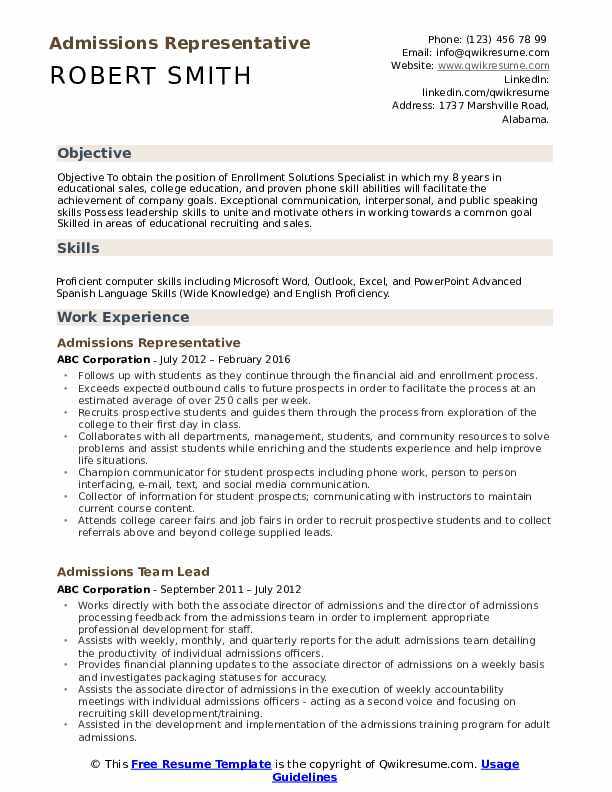 Conducted potential employee interviews with human resources & helped trained new employees & mentored team members completed performance evaluations; terminated employees or staff, when necessary managed, informed and counseled students on degree progress focused on graduation maintained direct contact with assigned students to monitor attendance and academic progress. Discussed and supported the student as she/he resolved student issues that occur in the classroom environment; worked with students experiencing academic difficulty or in other areas by helping them to develop and implement student action (success) plans. Identified students at-risk for academic failure and developed and implemented strategies to drive student success. Assisted students in filing academic, financial, and/or medical appeals. Successfully multi-tasked, handled competing priorities, and worked independently and as a part of the team. Made up to at least 400 outreach dials daily to potential leads achieved daily, weekly, monthly and quarterly goals set by upper management. Headline : Successful history in increasing key account base and guaranteeing client satisfaction. Demonstrated ability to grow business where others cannot see opportunities. Excellent background in customer service, exceeding client expectations from initial contact through program completion. Analytical and organized with the proven ability to identify client needs, make recommendations and implement effective solutions. Interviewed potential students with the intent to place them with industry partners. Also directed students to diesel programs such as freightliner, cummins and international brands. Direct and aggressively drive the growth, retention and profitability of a national automotive technical institute effectively present and articulate products through compelling demonstrations and professional correspondences. Assessed recruitment trends, proactively recruited candidates through direct recruitment internet and social media mining and other creative methods. Develop highly empathetic client relationships and earned a reputation for exceeding student show goals. Partner as liaison between external clients and internal clients to coordinate effective efforts, drive action and deliver results through cross collaboration. Ability to support multiple concurrent projects, negotiate, facilitate project planning meetings, meet tight deadlines and escalate effectively as necessary in order to meet project timelines to manage and mitigate project risks. Headline : Consistent achiever with exceptional knowledge of recruiting, customer service, administration, talent management and providing forward thinking leadership. Strong strategic marketing, team leadership and training background. Broad range of knowledge of employment, healthcare and IRS regulations/laws such as FMLA, ERISA, QLE's, FSA, HSA, HRA etc. Coordinates the development and direction of the admissions departments' activities in order to accomplish its goals and objectives. Fosters relationships with local government agencies such as pa careerlink, southwest training, the office of vocational rehabilitation and the va in order to develop new leads and identify prospective students. Manages all inquiries and makes effective contact with prospective students via phone, email and texting in addition to scheduling and conducting student interviews. Adheres to all local, state, and federal regulations and all accreditation standards in order to ensure compliance standards are being met. Effectively communicates with all other departments to ensure an optimum student experience. Maintains student files ensuring all documents are on file prior to students starting class. Maintain lead flow by calling and setting up appointments with prospective students including referrals and personally-developed leads. Assisted with admission and enrollment of new students while ensuring accurate and complete student records as required by laws, policies and administrative regulations. Summary : To continue to advance my professional career sales in which challenges me to apply my academic and professional background, along with executive skills in building interpersonal relationships. Responsible for connecting with prospective students and guiding them through the application and admission process. Assist them in with assessing their skill set, educational potential and career goals in order to help the student select an academic field of study. Connect with prospective students by answering incoming phone calls, responding to web inquires and attending college fairs explain academic programs and answer any inquiries regarding applications, enrollment, courses and financial aid proficient organizational, communication, listening and interpersonal skills, in addition to proficiency in microsoft office, database and software applications. Provide prospective students with general information on registration, program selection and academic requirements of their establishment. Responsible for conducting career planning sessions and presenting potential students with the information needed to make well-informed enrollment decisions. Providing excellent customer service, listening to the needs and career aspirations of potential students, resolving all issues, concerns and questions related to enrollment, following the admissions process. 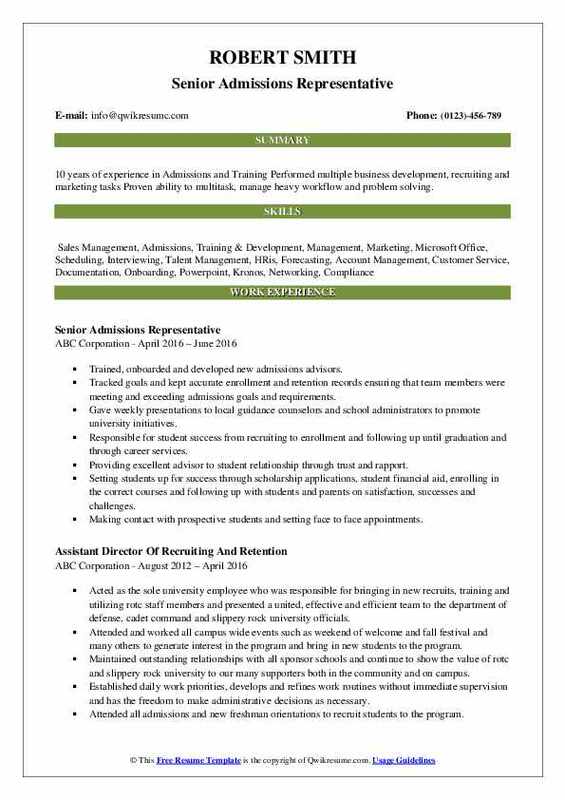 Schedule and conduct interviews, pursue qualified candidates for enrollment, and determine appropriateness of candidates for admission based upon career goal compatibility.